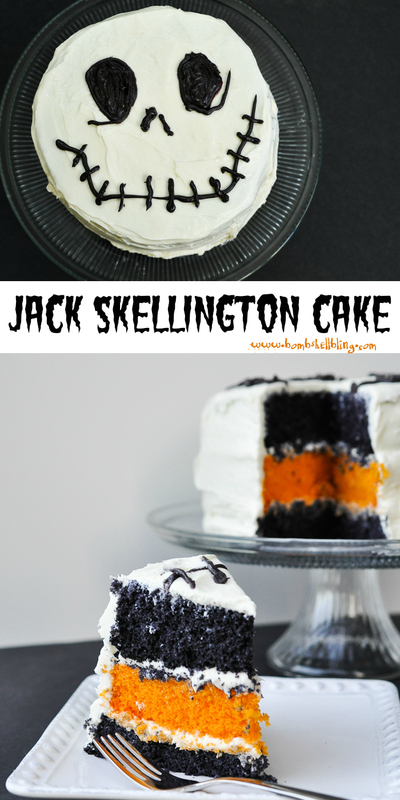 Hey there, Jack Skellington lovers! 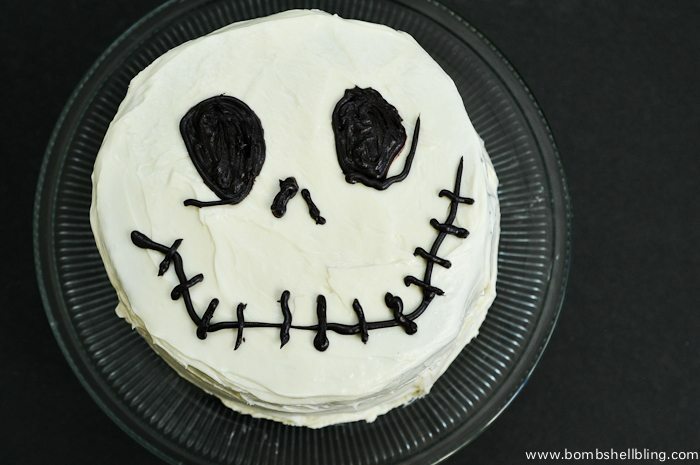 I am super excited to share my Jack Skellington Surprise Cake with you today. It may look simple and colorless on the outside . . . but inside is a a festive orange and black surprise! 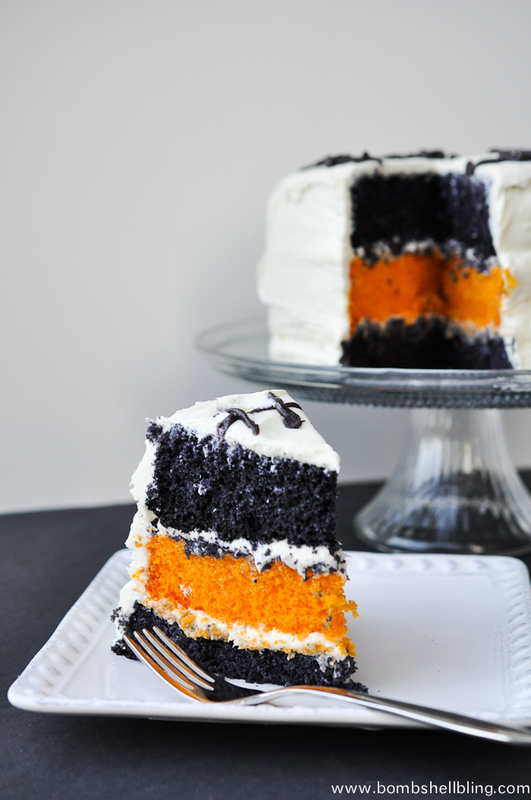 A perfect way to make a simple but impressive cake for a Halloween party! 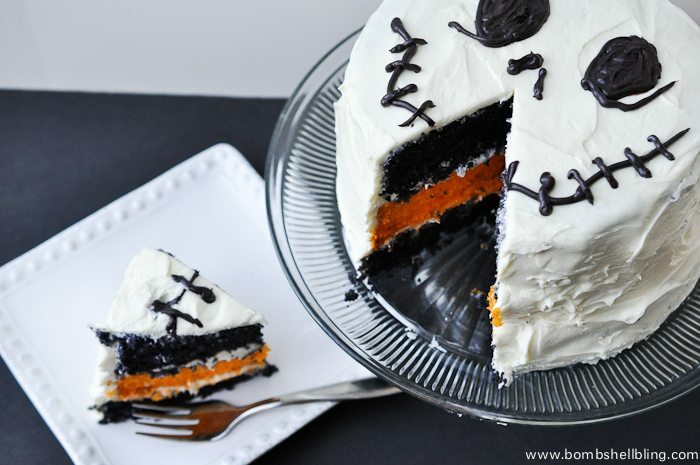 Before I show you how I made this cake, let’s take a look at the other fabulous black and white Halloween ideas that some of my friends cooked up for today. Such a talented group of ladies! Be sure to hop around to their sites and check out their projects in detail. To make the cake I whipped up two cake mixes. 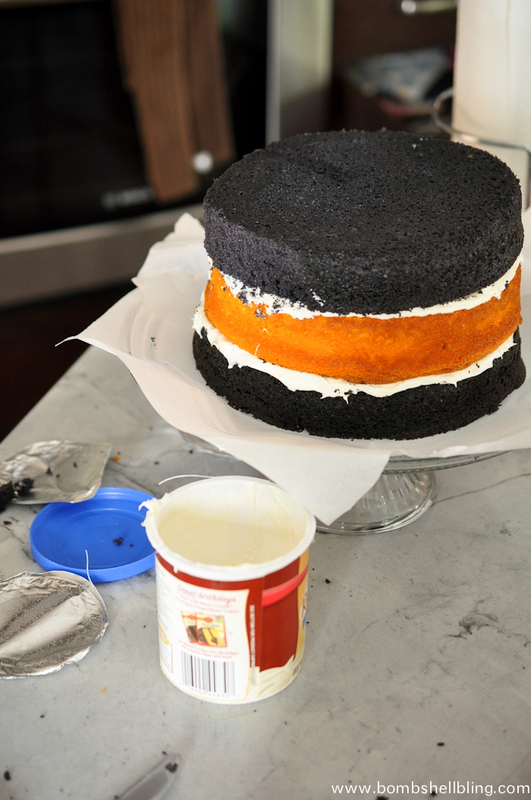 (That’s right….cake MIXES — I told you I was lazy! When it comes to kid food I totally take shortcuts like this. They care way more about the cute factor than the taste factor!) I used vanilla cake mixes and dumped about a third of it into a separate bowl. Next I added a ton of orange gel food coloring into the smaller bowl and a ton of black gel food coloring into the larger bowl and mixed both well until the colors were deep and rich. 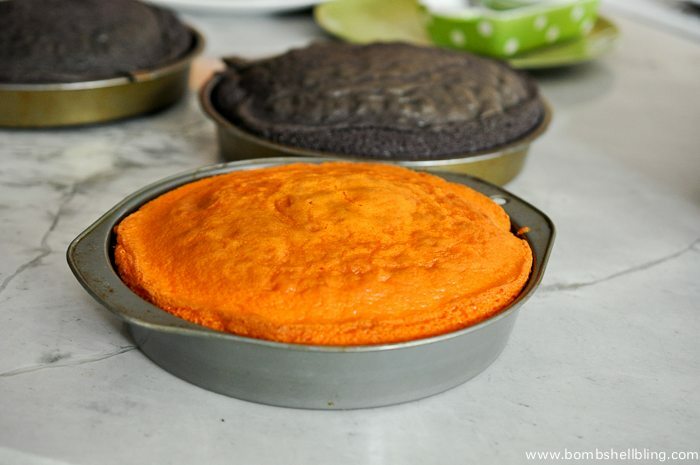 I poured them into round cake pans: two black, one orange. Because I used two mixes but only three pans they did rise above the rim of the pans, so I used a bread knife to carefully saw off the tops of the cakes until the were level. Check out that surprising center! I love it! All of the kids were very impressed with my mad skills. Heehee. 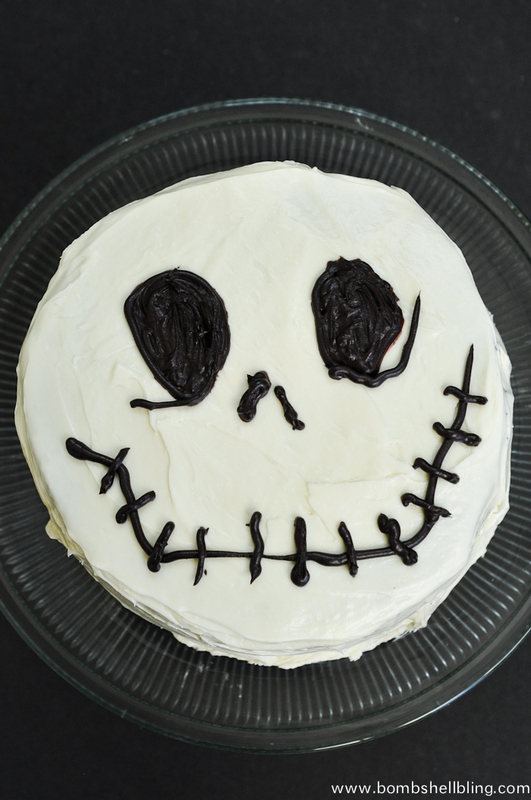 If you like the idea of a kid-friendly, simple cake but you don’t adore Jack the way that I do then maybe my Graveyard Cake will be more up your alley. If you love The Nightmare Before Christmas as much as I do then you should check out all of my other Jack Skellington inspired projects! Don’t forget to also follow along on my Pinterest Halloween board for more Halloween inspiration! Want to meet Jack Skellington and Sally? Head to Mickey’s Halloween Party! Mickey’s Halloween Party is one of my FAVORITE things ever!! The park transforms, the villains come out to meet you, the Dapper Dans wear ghoul makeup and float down a misty river singing songs from The Nightmare Before Christmas, the ride The Haunted Mansion is transformed to be The Nightmare Before Christmas themed, there are special Halloween-y treats available around the park, and you can go trick or treating as you walk from ride to ride!!! *SWOON* So if you are thinking about taking your little ones to “The Happiest Place on Earth,” then you should check out the travel agency Get Away Today. They have vacation LAYAWAY PLANS! Isn’t that brilliant?! Paying off your vacay a bit at a time makes it so much more realistic and affordable! Check out their amazing discounts and packages, and be sure to use the coupon code BLING to get an additional $10 off of your booking! 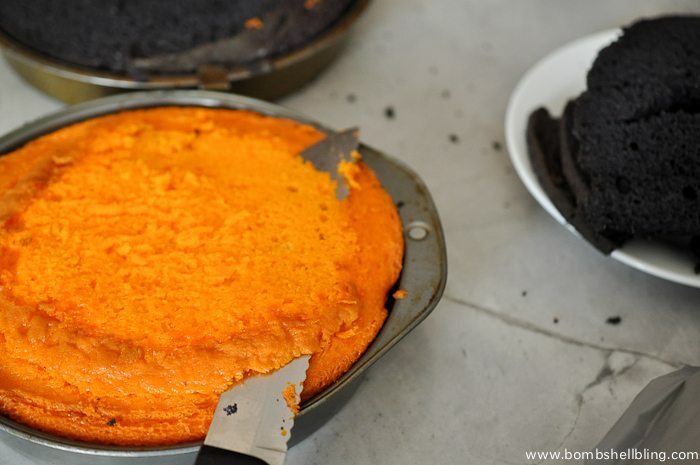 Fun cake, love the surprise orange/black inside! I love it! Even if it would have looked prettier with fondant, I think it taste so much better with icing! Sarah, I just love this cake! My son absolutely loved Jack Skellington when he was a little guy and still does! Visiting from i heart naptime and pinning – have a happy weekend!